The earbuds that come with the iPhone 5 and iPods. They also sell separately for $30. Everybody. Nobody. Your junk drawer, eventually. Little white plastic dots with an ergonomic new bulb shape. The speaker pokes out of the side of the buds, which is supposed to improve sound quality. The EarPods fit into the cartilage of your ear and nuzzle their way just into where you ear canal begins. They (still) constantly fall out. Better sound than the old buds. Universal plastic buds will never ever fit properly. 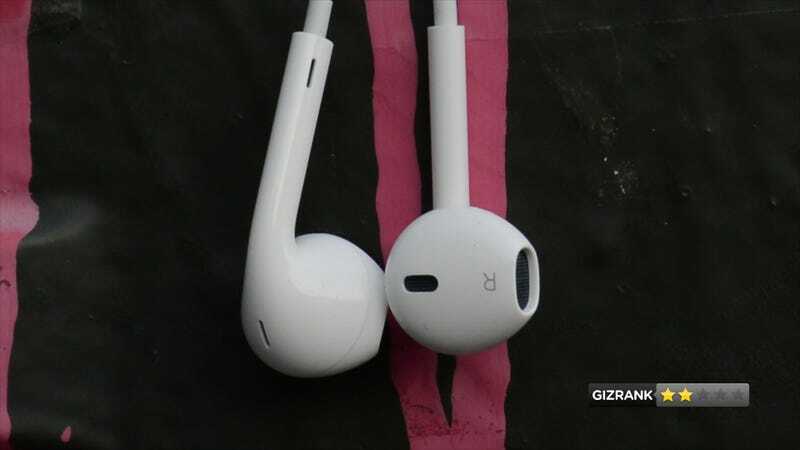 We want to thank Apple for trying to improve the earbuds of choice for people who don't know better. Tested on my iPhone using, you know, the music on my iPhone. The old buds were a tinny, muddy mess. On the EarPods, the high end still sounds crispy, but at least there's some bass in the mix now. The new Pods also sound incrementally clearer than the buds. You'll hear more details. They still hurt your ears, physically. More than sound quality, what people really hated about the old buds was an improper fit. This made them basically unusable unless sitting perfectly still. Could we get a little rubber to help them stay in place? So much for music on the go. EarPods. Weird name, right? Ear. Pods. EarPods. To be fair, this is a freebie accessory. Other device makers don't bother to bundle products with quality accessories. so why should we expect Apple to? If you buy an iPhone 5 or iPod, you won't have a choice. You will involuntarily own them. That's fine—they're a fine backup pair, on par with that pair of Skullcandy buds someone left at your house one night. But! We advise against purchasing individually packaged Apple EarPods from your neighborhood Apple Store. They're a little better than before, but they're still among the worst hardware Apple has ever made.